Before lacrosse alumni from the past 60 years met for a reunion dinner over Homecoming & Family Weekend, a game had to be played. Coach Mike Plantholt helped assemble the Red and Black teams from across the decades to ensure a range of fresh knees among the sides. They took to the Henry Street lacrosse practice field around noon on Saturday, Oct. 6, for a game that ended 5-3 or 5-4 (the final score was beside the point — alumni won). More than 100 alumni and friends of the program attended the evening’s reunion, along with current players. “Their attendance is a testament to the enduring affection for the program held by so many,” said Plantholt. 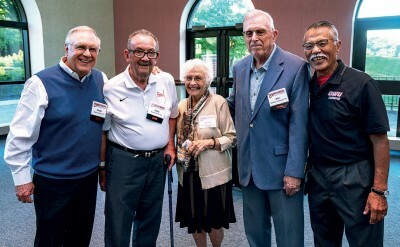 (From left) Charles “Chikk” Myers ’73, son of inaugural coach Fred Myers; original team member Russell “Buzz” Wilson ’59; the “first lady of OWU lacrosse” Sylvia Willoughby Myers ’69; original team member Bill Ackerman ’58; and Pete Lee ’65 were among the more than 100 former and current players and friends who returned for the reunion dinner. 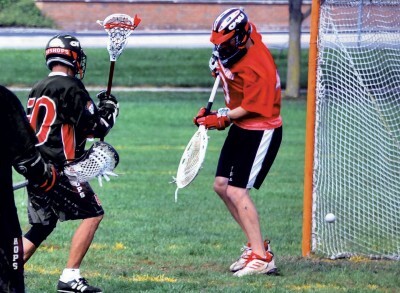 Andrew Stringer ’73, who has stayed on the field as a college referee and as a high school coach for his son, was unable to attend the 60th reunion but reflected on his experiences of playing in OWU’s “lacrosse legends” games. The next tournament is Jan. 18-21, 2019, in Weston, Florida. The Florida Lacrosse Classic features divisions for ages 40 and up. Pete Lee and Steve Corrigan ’74 are always looking for recruits. Contact them at owu.legends@gmail.com.